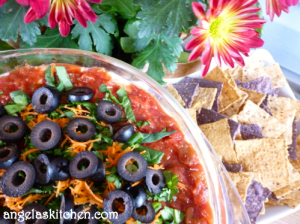 When I received my Way Better Snacks Tortilla Chips I knew a creamy, decadent, over-the-top dip had to be made. Of course, that didn’t mean I wanted to work that hard pulling it together. It is for a party after all! I just want it to look and taste like it took a long time to pull together. I am that kind of sneaky! 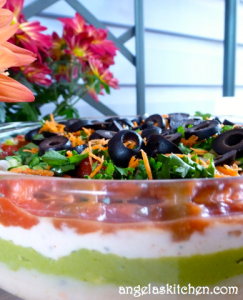 🙂 Classic 7-layer dip has all kinds of dairy from the cheese to the sour cream. Some recipes even have you cooking stuff up in butter, but not this little beauty. Each layer can be made from scratch if you got your whole foodie pants on, OR you can use a nifty short cut and call it a day. Either way, it is a snap to pull together and the taste is out of this world. I served this dip up with Simply Sweet Chili, Unbeatable Blues and the Simply Sunny Multi Grain Tortilla Chips. A little something different for all of us, as we couldn’t seem to narrow it down to just one. 🙂 Yum! There may seem to be a LOOOONNNG list of ingredients, however even when mixing this up from scratch, I can pull this together in 20 to 30 minutes. When using the already made options, in about 10 to 15 minutes. See? Easy-peasy! Either way is delicious! 1. Heat oil on bottom of saucepan over medium-high heat. Sauté garlic until it releases its scent, then add beans (I use cannellini in the above pic), salt, cumin and water. Cook, stirring and mashing beans against the side of the pan with spoon until the consistency desired. Remove from heat. Stir in green chilies. Smooth onto the bottom of a 8″ clear glass cake pan in an even layer and pop into the fridge to cool while assembling your other layer components. OR simply open a can of gluten and dairy free refried beans and smooth onto the bottom of the pan. 2. Peel and chop avocados. (To see how to easily cut avocados, follow this link) Scoop avocado into a bowl. Add lime juice, salt, pepper and garlic powder. Mash with a fork, mixing until your desired consistency. OR simply open a 7 ounce package of your favorite gluten and dairy free guacamole. Spread either guacamole over the refried bean layer in pan. 3. Mix gluten and dairy free yogurt or sour cream substitute with dried onion, salt, chili powder, cumin, garlic powder and oregano until well blended. Smooth over guacamole layer. 4. Mix tomato, red onion, jalapeño, lime juice, cilantro and salt and pepper to taste. OR simply open a 16 ounce jar of your favorite salsa. Carefully spread salsa over creamy layer. I accomplished this by dotting the salsa around the pan, then smoothing. This technique disturbed the creamy layer the least. 5. Mix together green onions, spinach and cilantro. Sprinkle on top of salsa layer. 6. Finely grate carrot and sprinkle on green layer. 7. Sprinkle olives on top of carrot layer. Wrap pan and chill until you serve dip. Enjoy! « Apple Pie Dip… What could be better for fall?